Victoria, Mahe (Seychelles) – July 16, 2018 (travelindex.com) – I am this week issuing this edition of the Saint Ange Tourism Report from Accra in Ghana where I am a panellist at Routes Africa 2018. Supporting such tourism and aviation events on the Continent of Africa is of utmost importance if Africa wants to re-write its narrative and claim back ‘Brand Africa’. Routes Africa brings together top-level speakers from across the sphere of aviation to discuss the most pressing issues facing the industry. Addresses will be delivered by airline CEOs and senior network planners, along with some of the most influential figures from across Africa and beyond. Panel sessions, keynote speeches and training opportunities will ensure that delegates maximise the value of their attendance at Routes Africa 2018. I am honoured to have been invited to be part of the panellist for a discussion on “Economic impact of tourism – tourism authorities and airports in partnership”. Ethiopian Airlines announced on July 10 that it had finalised preparations to resume daily flights to Asmara, Eritrea, on July 17. This follows agreements reached in Asmara between Dr. Abiy Ahmed, Prime Minister of the Federal Democratic Republic of Ethiopia, and President Isaias Afewerki of the State of Eritrea. The route will be operated by a Boeing 787 between July 17 and October 27. Regarding the resumption of flights to Eritrea’s capital, Group CEO of Ethiopian Airlines, Tewolde GebreMariam, said: “We at Ethiopian feel an immense honour and joy to resume scheduled flights to Asmara after 20 years, following the visit to Eritrea by Dr. Ahmed, Prime Minister of the Federal Democratic Republic of Ethiopia. With the opening of a new chapter of peace and friendship between the two sisterly countries, we look forward to starting flights to Asmara with the B787, the most technologically advanced commercial aircraft, which gives customers unparalleled on-board comfort.” According to GebreMariam, the resumption of air links will play a critical role in boosting the overall political, economic, trade and people-to-people ties between the countries. “Very quickly, we plan to operate multiple daily services and to start cargo flights, in view of the huge market potential between the two countries,” added GebreMariam. Success for Africa is when we see the recognition for the continent beyond its own borders. The election of Sebastian Mikosz, the Group MD and CEO of Kenya Airways to the Board of the International Air Transport Association (IATA) is testament to the progress by the Continent in re-writing its own narrative and pushing Brand Africa forward. The elections took place at the 74th Annual General Meeting of IATA in Sydney Australia. Head of State visits always makes world news, and the continent of Africa received two dignitaries during June and July that can only help ‘Brand Africa’ to remain visible and relevant in the world of tourism. The visit by French President Emmanuel Macron to Nigeria among other countries, and by former President Barack Obama to Kenya and South Africa, has boosted the coverage of the African Continent and this can only be positive for the 54 Member States of the continent. On the Seychelles front, the local tourism industry continue to raise operating costs as their main challenge. President Danny Faure personally visited hotel establishments on the islands of Praslin and La Digue last week. The interest by the Head of State for the tourism industry is welcomed, especially as the President was himself the Chair of the island’s Cross Sectorial Meetings, when he was Vice President and is therefore well briefed on the industry’s challenges. 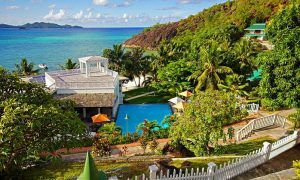 Many on the two islands have echoed the appeal for the President to appreciate that hotels in Seychelles were not competing amongst themselves, but were measured in Tour Operator Programs with properties in other holiday destinations. The comparison of apples for apples, or oranges for oranges, is where the Seychelles rate structures becomes a cause for concern. The need for an adequate marketing budget to ensure visibility and relevance is also the battle cry today, as it was yesterday, and the day before. As we are in in the final stages of the 2018 FIFA World Cup Fever, it is important to analyse the many football teams everyone had expected to see progress from the elimination rounds, but that instead faded away into thin air. Never take anything for granted, is the morale behind these last games, and it is the same for tourism destinations. The need to continuously innovate, and to then communicate what we are doing to remain visible and relevant, is the key for success. It is also important for the destination, (the country) to live up to the expectations of its visitors.